In most towns throughout the Ozarks are found imposing old mansions. Remnants of the past, they invoke in the passerby questions of who once lived there and what life was like when the house was new. In Carthage, Missouri, on a quiet shaded street stands a vacant parking lot. Once this was the address of just such a magnificent residence. How that home came to be built and where it is now, is a story that has its beginnings in the years following the Civil War which left Carthage a burned out ghost town. In the 1870's large deposits of lead and zinc were discovered in the vicinity. Overnight, the town boomed, and soon Carthage was calling herself the Queen City of the Southwest and claiming more millionaires per capita than any small town in the United States. Naturally, this prosperity attracted many entrepreneurs. Among those drawn to Carthage was Curtis Wright, a much decorated Civil War veteran, who was the owner of a large furniture factory in Indiana. Yet he was still not satisfied and had set out on a six month tour of the Midwest to find a place to relocate his family and fortune. Wright's life long hobby had been geology, and his first impression of Carthage was that an area so rich in mineral wealth and scenic beauty should be his new dwelling place. Curtis wrote his wife Nira, "Bring our children to this Queen City, and I promise to build for you the most majestic house in a town of elegant residences." After their arrival, the Wrights soon became one of the most prominent families in the community. Their ancestry was certainly impressive. Nira was the favorite niece of General George Crook, while Curtis was a distant cousin of the famed aviators, Orville and Wilbur. However, around town, Wright was best known as the man who owned the Carthage Stone Company, the mine that had supplied limestone blocks for important public buildings and houses all over Missouri. Financially well fixed by 1891, Curtis set about to fulfill his earlier promise and build his family the house what would become the focal point of their lives. Two architects and Wright drew up the plans for the Queene Anne mansion whose exterior featured medieval style turrets and chimneys. The front was buttressed by an ornately carved veranda with huge circular windows. The lavishly decorated interior contained 21 rooms, featuring imported Italian marble fireplaces and Tiffany-styled windows. By far the most impressive characteristic of the $22,000 mansion was the intricately carved oak stairwell and massive woodwork found throughout. Beginning with their New Year's housewarming party, the Wright home soon became the center of the social scene in Carthage. People of all ages congregated there for club meetings, parties, and receptions. The Wrights were host to many famous house guests, such as family friend Buffalo Bill, and author Harold Bell Wright. 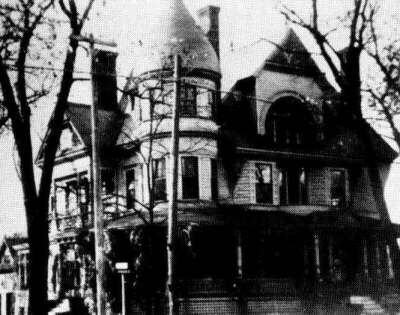 Such were the glory days in the mansion at 304 Macon Street. However, children grow up and move away, and fortunes are lost, and in his old age Curtis was forced to trade his home. Over the next eighty years the house had four owners, and time took its toll, until the once elegant resident was only a white elephant on the house market. In 1981 a Eureka Springs businessman, Ron Evans, while traveling through Carthage spotted the "For Sale" sign. A grandiose idea formed in his mind. He would buy the house and move it to Eureka Springs as a tourist attraction. When Evans' intentions became public, it set off a major conflict in Carthage. Realizing that a part of their history was about to be moved out from under them, several townspeople and organizations lobbied to stop the sale of the house. But it was not to be, and Evans hired workmen from all over the region to begin dismantling the structure. It took over forty trips to transport the disassembled sections to Arkansas. As they watched the big trucks go down the main street, many in Carthage felt it was a sad ending for the old house, but as it was slowly reassembled in Eureka Springs, people there saw it as a new beginning for the stately residence. "My buying the house was really the compromise that saved it. The funeral home was going to tear it down for a parking lot. You tell me who would have been the winner in the conflict then." -- Ron Evans, now the owner of the house. For the thousands of tourists who have already visited the restored mansion, it is a chance to see how those of a bygone era lived. Today, when one walks through the rooms, there is a feeling that the Wright family has only stepped out for just a moment, and that when they return, they will agree that moving their home was truly saving history. "When I was little we used to have the best times at that house. I remember when Buffalo Bill stayed there. It seemed like the whole town turned out. Those were Carthage glory days. No wonder I cried when those big trucks hauled a piece of our history away." -- Elderly resident of Carthage. Nancy Jane Sneed is a teacher at Sarcoxie High School. 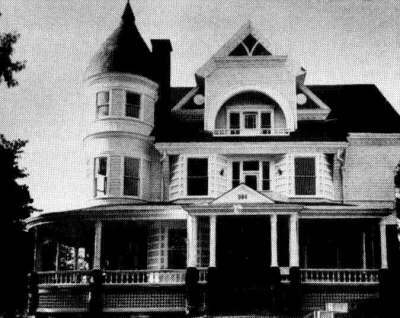 The story of the Wright House comes in part from a media project prepared for the History Day Contest by Sarcoxie students in 1986. Photographs and some of the research materials were supplied by Michele Newton who is the curator of the newly constructed Powers Museum in Carthage.